The tale of Monster Soul takes place in the land of Elfenland where humans and monsters inhabit. The main characters is a group of monsters called the Black Airs. The Black Airs is recorded as the strongest group of the monster forces in the great war between the humans and monsters. 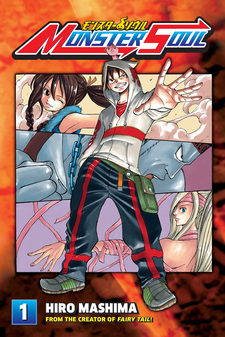 Monster Soul was published in English by Kodansha Comics USA from May 13, 2014 to August 12, 2014. Monster Soul is a shounen, action adventure anime with a healthy does of comedy. 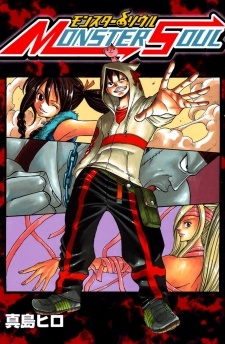 Yes, it is very similar to One Piece, as Fairy Tail is since they have the same author. Monster and Humans have a fought for a very long time. But as times passed, the Monsters finally lost and they were forced back into hiding. During those days, one group of monsters were very active, they were called the Black Air. Monster Soul has a lot of potential. Because for a nice change of pace, instead of human protagonist, you get monsters. Although it is not very diverse, aside from their appearance, the protagonist dont do anything for them to be considered a monster. They still are the good guys, no matter how you see it. The problem with this manga is everything is predictable. I can jump from the first chapter to the last, and it wont make much difference. Yes the chapters from 2-4 are not important, they dont help push the story, but rather fills its void, heck even the ending was horrible. It was all too given. And because it only has 7 chapters, I didnt feel any connection with the story nor the characters. There was no development either, not one bit. Thankfully for those who are fond of rollicking antics, it ameliorates the manga a bit. Every member of Black Air have their own quirky trait. You have Aki, who is well... a complete replica of Monkey. D Luffy, Touran a careless, self-proclaimed beauty, Mamii who everyone consider the big sister of the group and frequently desires to strip in front of everyone for no apparent reason, James the brute of the group who never has a dry eye and Joba the odd pet of the group who is pretty much useless and unnecessary. The art is of course like Fairy Tail. The art during the action are not bad too, but they were not exciting as I hope to be. Their were no creative abilities here. Sadly, every ability is dull. It has decent action balance w/a lot of comic relief. But its not enough to pull it through.Overall, Monster Soul is enjoyable.... if you couldnt care less about the lackluster of story and character development. Just read it for the laughs.